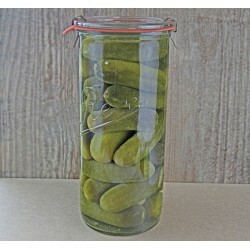 Weck and Rex jars are high quality glass jars made in Europe. They are made of heavy duty glass with a glass lid, natural rubber seal and stainless steel clips. These jars are certified safe to bake and microwave without risk of explosion. The straight sided jars are also suited for freezing: for this purpose we recommend using Keep Fresh lids rather than the glass lid to allow room for expansion. 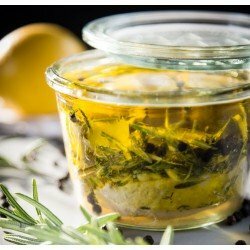 80ml Weck Preserving Mold Jars in a pack of 12. Take Small seals.Weck reusable Glass Jars are of the highest quality and contain NO BPA! (Bisphenol A).These jars are suitable for water bath, and pressure canning. With the added bonus of being able to freeze and bake! (Baking in the jar is not possible with Ball Mason or Fowlers Vacola)The most versatile and beautiful preserving jar available today.Weck canning jars are made with thick glass to withstand boiling, sterilizing and processing over and over again. Glass lids preclude issues with rusting, and the tab on the replaceab.. 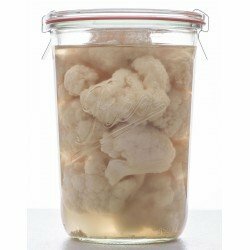 The Rex 1 litre Glass Jar is an extremely useful jar for contemporary stockpiling - dry goods from aniseed to cinnamon or cooked fruit, all kinds of garden vegetables either fresh or preserved, meats, broths and more. Compote or muesli flakes, gummy bears or biscuits all fit perfectly into this handy size jar. It's also the go-to jar for fermenting along with its larger 1.5 litre friend. Suit the large size fermenting lids. Rex jars are absolutely free of plasticizers and heavy metals. Heat resistant and reusable. Suitable for all dishwashers, freezers, ovens or microwave.. The Rex mini tulip jar is a charming way to showcase all sorts of sweets, puddings or yoghurts. It’s just the right size for a decadent chocolate mousse or a tangy homemade yoghurt. Use it with a storage lid (our wooden ones are ideal) to keep herbs and spices fresh. Perfect also for gifts, candles and picnics. Absolutely free of plasticizers and heavy metals. Heat resistant and reusable. Suitable for all dishwashers, freezers, ovens or microwaves. Comes in a chic six-pack carton including lid, sealing ring and clamps. ..